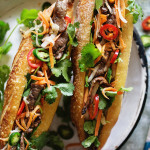 A baking blog with dessert recipes and savory hits. This is a sponsored post in collaboration with the California Strawberry Commission. 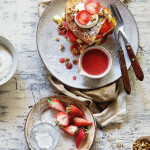 If you love strawberries, French toast and want to celebrate the moms in your life all in one tasty bite, then def hit print on this Strawberry Custard French Toast. 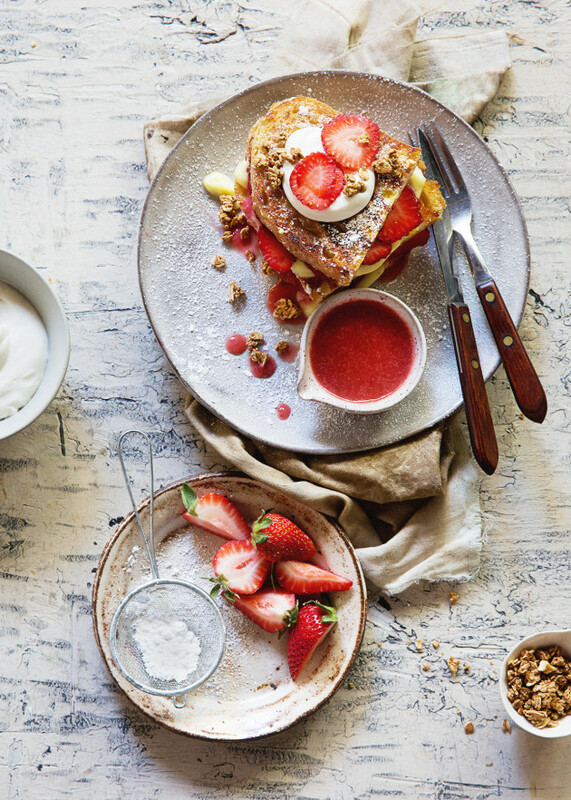 This is the recipe that’s going to elevate your French toast game. Sure this might be a departure from the classic with add-ins, like pastry cream, strawberry coulis, fresh sliced strawberries and a sprinkling of granola, but I’ve been known to have a heavy hand. This is no exception. Strawberries are one of my favorite fruits and in season now, so naturally I’m making it the star of my Mother’s Day Brunch. For good reason to, one serving of eight strawberries has more vitamin C than an orange. 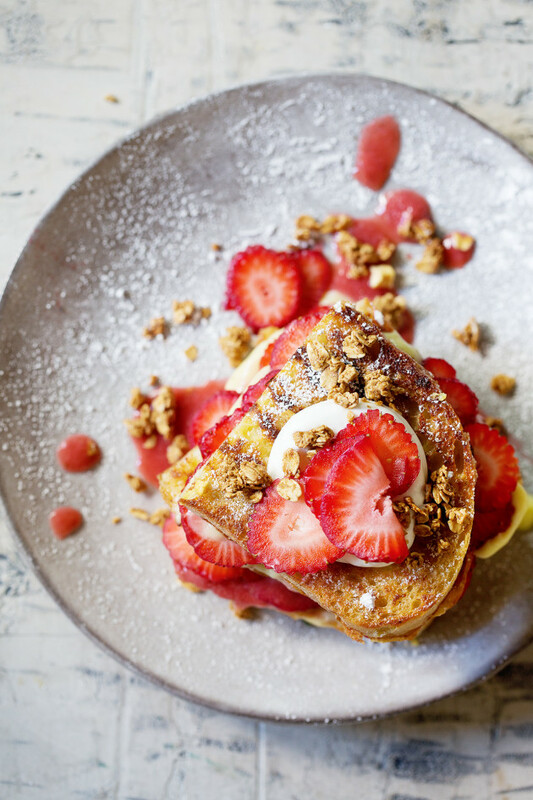 And since strawberries are low in sugar and with just 50 calories per one cup serving, I knew I could pile them on in this French toast recipe. 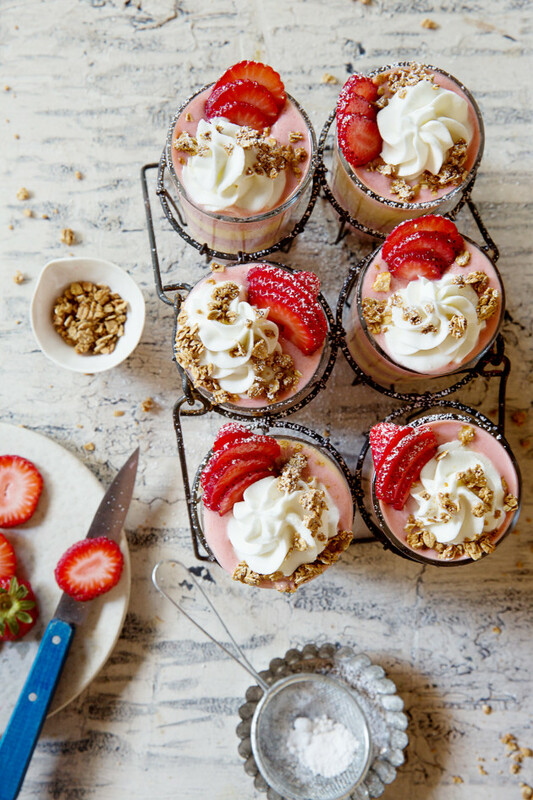 The benefits are of course naturally tasty, but it also comes with beneficial antioxidants, so I’m doubling down on the strawberries and paring this main dish with Matt’s Layered Strawberry Smoothie Parfait (click here for the recipe). I cannot wait for my tasty Mother’s Day brunch, especially since Matt and the boys will be turning this out while I sit in the sun and sip on Strawberry Mimosas. For more Mother’s Day inspiration, head over to the California Strawberry Commission for more recipe ideas. To make the filing: Combine cornstarch and ½ cup milk and stir to dissolve. Beat whole eggs and yolks into cornstarch mixture; set aside. Prepare an ice bath; set aside. Combine remaining milk with sugar and salt in a saucepan and bring to a boil over medium heat. Remove sauce pan from heat and transfer mixture to a new pan to reduce any residual heat. Set aside and cool milk mixture for 5 minutes. Slowly add egg mixture into hot milk stirring constantly so the eggs do not curdle. Return mixture to stovetop and stir vigorously until mixture comes to a boil. Continue to stir until the whisk leaves a trail in the pastry cream, about 5-7 minutes. Once pastry cream reaches this stage, remove sauce pan from heat and stir in butter and vanilla extract. Transfer the saucepan to the ice bath. Stir occasionally until pastry cream is cool about 30 minutes. To make the French toast: In shallow bowl like a pie pan, whisk together the eggs, half and half and vanilla bean paste. Heat a nonstick pan or a griddle. Add butter and let melt. Dip each slice of bread in the egg mixture, making sure that each side is soaked. Let any excess drip back into the bowl. Place the dipped slice onto the griddle. Repeat with remaining sandwiches. Cook for about 2 to 3 minutes on each side, or until a golden crust forms. 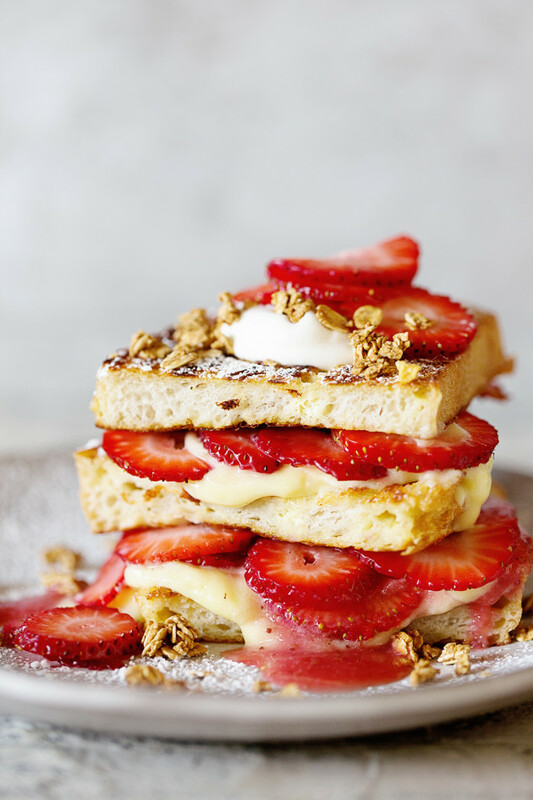 To serve, place one piece of French toast down on a plate and layer with pastry cream, fresh sliced strawberries and strawberry coulis. Repeat once more and top with a third piece of french toast, whipped cream, granola and additional sliced strawberries. To make strawberry coulis: In a large sauce pan, add 1 pound of strawberry, 1/4 cup sugar, zest of lemon and bring to boil. Lower heat and cook for 4 to 5 minutes on medium. Transfer mixture to a blender and process until smooth. Store in the refrigerator for up to 2 days. To make whipped cream: In a medium mixing bowl, combine 1 cup heavy cream and 2 tablespoons of granulated sugar. Beat until soft peaks forms. 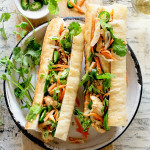 Don't miss a recipe! 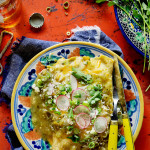 Sign up today and get the latest recipesfrom Bakers Royale delivered right to your inbox!